When talented designers and tech lovers join forces, great things can happen. That’s the story of Bare Conductive, a London-based group creating tools that enable and inspire creative uses of technology. 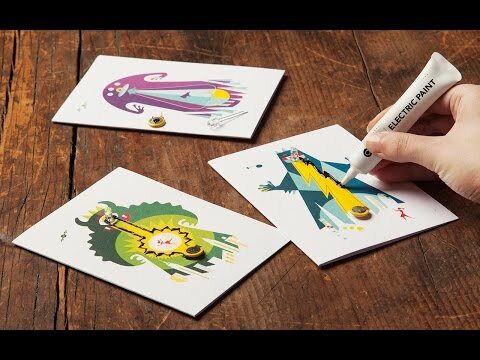 Their signature product, Electric Paint, is nontoxic, easy-to-use paint that becomes conductive when it dries. Paint a wire on almost anything—paper, wood, walls, fabric—and all sorts of new projects are now possible. This incredible paint can teach beginners or kids about electricity. It can even solder and attach items without heat. And more ambitious endeavors incorporate hardware and computer coding to turn the paint into light switches, musical instruments, and more. See where your imagination, and a little help from Bare Conductive, will take you. We're very excited to be working with The Grommet. We make an amazing new material called Electric Paint and our Flashing Card Sets are the perfect way to get making. If you have a cool idea or question I'm here for you. We can't wait to see what you get up to! Can I use the paints to make my own drawings or do I have to follow your designs? Hi Elizabeth, you could, yes. Though it may be tricky to utilize the electricity components. I'll let Matt provide further details on how that could be accomplished. @Mike @Elizabeth You certainly could! As you'll see on the back of the cards there are some important things to remember about getting the LED and battery the right way around (aka polarity), but other than that its pretty much up to you. @Elizabeth If you read the product description, it says "Paint a wire on almost anything—paper, wood, walls, fabric—and all sorts of new projects are now possible." I infer from this the designs included are intended as practice sheets, so users can get used to the medium and how it works. @Janet I agree with Carole, that's what I would want to get. @Janet Matt Here! There is typically a good amount of material left in the pen (depending on how neat you are). We often find that people will pick one of the kits, try one of the cards to get their feet wet and then start creating on their own. @Matt Would this product be something that a 12 and 9 year old would like. Thinking valentines here for grandkids. Just such a cool idea. as a project. You mentioned to contact Matt....how do I do that? Hi Donna, this would probably be great for your grandson and his class. You can contact Matt by clicking on the link in my comment below. Hi Lisa, yes classroom sets are available. You can contact our customer experience team here and they will connect you with Matt. wondering how much voltage the paint will handle? Could this be used on fabrics? Does the paint come in colours or is it just black? Hello @Mitra, the paint is carbon-based and therefore only comes in black. You can paint over it another colour though- spraying an even layer over it works really well. Hi, I'm wondering if your paint could be used for electroforming with copper and whether the paint is sold by itself and the available size tubes/jars. Hi Sharon, for additional tube/jar sizes and paint on its own you can contact our customer experience team here and they'll connect you with Matt. I'll let Matt himself handle the electroforming aspect of your question. @Sharon- sorry for the short response there. Electric Paint won't work for electroforming unfortunately as the paint is water soluble. Hmmm... Too bad... There are other water-based conductive paint products that are designed for electroforming. I believe they are very water-resistant after drying and I'd hoped the Bare paint was too. I'm assuming that the water soluble thing applies even after the paint has fully dried...? I have shirts and sweatshirts that utilized a very similar product and the designs can be made to emit sounds--and actual phrases and music bytouching trigger points.Is this the same product? Hi Gary, it sounds like a similar concept, but I'm not sure if it is Bare Conductive. I'll let Matt confirm. @Mike Hi Gary, sounds like cool stuff. You could certainly use Electric Paint as a sensor and then trigger lots of different events - sounds, lights, etc. When talented designers and tech lovers join forces, great things can happen. 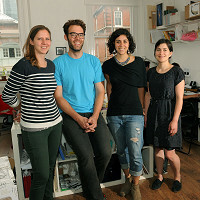 That’s the story of Bare Conductive, a London-based group creating tools that enable and inspire creative uses of technology. 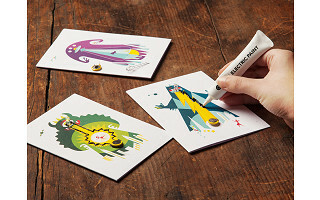 Their signature product, Electric Paint, is nontoxic, easy-to-use paint that becomes conductive when it dries. Paint a wire on almost anything—paper, wood, walls, fabric—and all sorts of new projects are now possible. 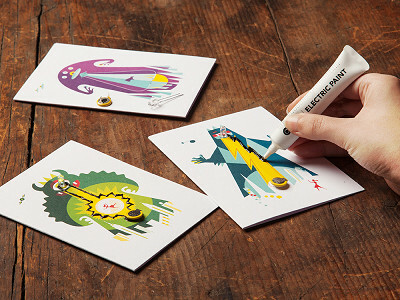 This incredible paint can teach beginners or kids about electricity. It can even solder and attach items without heat. And more ambitious endeavors incorporate hardware and computer coding to turn the paint into light switches, musical instruments, and more.